April rugby – you gotta love it. Playoffs matches were fiercely contested across the land and the Official USA D1 National Championship Preview Match was played between Cal and St Marys. St Marys won in a tight match where neither side committed their full squads but the crowd was certainly entertained. It is a good time to be a Pelican, that is for sure. It is a good time to be a Pelican except up in Sacramento, apparently, as the late season storm that ran through last week cancelled the Epic Wrap Battle In The State Capital. This has lead to one of the more head scratching decisions I have ever heard of. At the start of the day San Jose Seahawks had a 4 point advantage and a 99 point advantage in point differential over Sacramento Blackhawks while Life West trailed SFDD by 5 points for the 4th and final playoff spot with a significant, tie breaking point differential advantage. So for Sacramento to get the #1 seed they would need a bonus point win and for Life West to make the playoffs they would need a bonus point win – any other result than a bonus point win for either team and the table wouldn’t change with Vacaville in the #3 slot to round things out. Then the game was rained out. So what to do? Neither Life West nor Sacramento were able to arrange a midweek game so it went to (I assume) the competitions committee to sort out the final table. What the result of that meeting was… well that is the head scratching part. Somehow it was decided that 7 wins, 0 losses and 1 draw for 37 points with a +191 point differential was not as good as 6 wins, 0 losses and 1 draw for 33 points with a +92 point differential. Yes, Sacramento was awarded the #1 seed and will play SFGG while San Jose got the #2 seed and will host Vacaville. Sacramento was rewarded for playing fewer matches because the committee decided to average out the points per game. Yes, the rainout was unfortunate but does that equate to a bonus point win? Someone needs to take a very long look at the NCRFU regulations and come up with a more equitable system for rainouts at the end of the season. Granted, this is Northern California and April rainouts are rare indeed, but this can not be allowed to happen again. As befits a conference final, Cal Maritime was basking in glorious sunshine for Saturday’s game between Fresno State and UN Reno. Two enthusiastic squads were going through their pre-game routine while the boot checks, coin toss and general chat with both captains were executed. As this was a game requiring a result, a quick discussion was held with the Tournament Commissioner and the two coaches to confirm the Extra Time policy to be applied if it were to be required. After a pre-game consult with my two AR’s, JT and Giles, the game was started with Reno kicking off to Fresno. From the early stages it was clear that Fresno were collectively slightly better drilled in their game plan and looking to play on the front foot at every opportunity while Reno, with some strong talent in their ranks were a little less dynamic. This showed in the first 15 minutes with Fresno scoring 3 tries (one converted) following multiple phases – Fresno were managing to keep the ball moving through offloads and quick tackle recycles which stretched the Reno defense and created the try scoring line breaks. Reno, with some strong running from 10 and 15 started to get field position and following a few forward charges recycled well and moved the ball left to the stretched defense and a cutback lead to a score by the posts, converted. 17-7. The strong tackling of the Reno No 8 also became a feature of the game through this phase. Fresno restored their momentum over the next 10 minutes and crossed for 2 tries out wide, left and right, pushing the lead to 27-7. Reno responded with a similar score to their first with some good hands creating the scoring opportunity, unconverted for 27-12. Fresno responded with another 5 pointer and the half finished shortly after Reno closed the score to 32-17 with a more forwards driven score. The scoreline reflected the game well at half time. The second half became one way traffic on the scoreboard with strong midfield running creating the openings for 8 second half tries with the Fresno No 12 being very prominent on the try count with 4 (later named player of the match). No 12 also took over conversion duties and managed 3 successful kicks. Reno remained fully committed throughout but playing into the breeze in the second half failed to capitalize on the opportunities they created. The last 20 minutes were punctuated by many scrums as players tired and more frequent knock-ons occurred. The final score was 76-17 in favor of Fresno. At the end of the game winner and runner-up medals were presented along with the Conference Trophy. A special thanks to Giles and JT for excellent old school (no radios required!) team of 3 assistance with great eye contact and simple, clear visual signals throughout! The second half started just like the first half with an immediate score, only this time it was Colusa who scored first to extend the lead to 24-12. Redwood knew they had to score next or the game would be out of hand and score they did to tighten things up at 24-19. Both teams were running hard and tackling harder in a real barn burner of a match. Colusa struck next with about 10 minutes to play to reestablish a two score cushion but, yet again, Redwood would not give up. This time it was the Redwood fullback who intercepted a long skip pass and raced 80 meters to score. This set up a tense final 5 minutes as Redwood was only down 5 points and Colusa was desperately trying to kill the clock. Unfortunately for the visitors they just didn’t seem to be able to get their hands on the ball as Colusa camped in their 22, twice getting over the line only to be held up in goal. Finally, with time expired, Colusa got their reward with a try, duly converted. The ball sailed over the uprights, I blew for the successful conversion, then blew full time. What a match! Special thanks must be given to captains Sili Aiono of Redwood Empire and Cody Beckley of Colusa. They were a pleasure to work with and there was never a hint of foul play in the entire match. Both teams were extremely well behaved and were quite obviously there to play rugby, and play they did. I originally expected to show up for a nice, easy day of ARing. 2 games, a light jog, nothing too much However, when Pete Smith went down 20 minutes into the match with an ankle injury, I was called into action and ended up taking control of a very one sided match. Stanford had complete control of the match that was disrupted by bursts of excitement when OSU would score a try on a great few phases of crash ball and then a wide pass to their speedy wing. There were few issues with both teams (in fact, i think there were 7 total penalties in the entire game). Congrats to Stanford on their advancement to the championship game. One of the most entertaining matches I have seen in quite some time. WSU was clearly the better team with most of their runs making 6 or so meters. However, Davis was able to stay with them through the first half, and quite a few second half mistakes from WSU, including a knock on .2 seconds before a try, and a girl pulling another down by the pony tail, led to Davis being victorious. Fantastic game to officiate and thanks to John Pohlman and Jen Tetler for contributing to the event. First half of the game saw Stanford in the driver’s seat with a comfortable 24-15 lead. Both teams were playing good, well-disciplined rugby and only committed 4 penalties in the first half; Davis committed 3 of the 4 penalties and they were the result of sustained pressure. In the second half of play both teams looked to contest the breakdown more; Davis committed 3 penalties in the third quarter of play and received a yellow card for the third infraction deep in their own defending 5 meter line. The resulting play saw Stanford jump to its biggest lead, 31-22 with 15 minutes remaining. Stanford appeared to take their foot off the gas and it resulted in Davis scoring 4 tries in the last 12 minutes of play. Both programs demonstrated balanced attacks and good defensive composure. 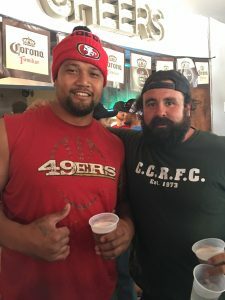 All-in-all a great demonstration of college rugby in Northern California: 75 points scored; 12 penalties total; and fantastic back and forth action. Both programs will benefit from the lessons learned during the game. A special shout out to the best captains I have had all year, Sili Aiono from Redwood Empire and Cody Beckley from Colusa County enjoying a refreshing post match beverage. This entry was posted in News on April 12, 2018 by James Hinkin.